"Sometimes we can be so caught up in our own misery that we can no longer determine the truth from lies." Please do not do this novel as an injustice by reading it as a stand alone. 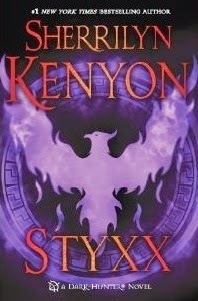 If you are reading the both the Dark Hunter series and Chronicles of Nick, this should be read before Illusion, as it gives away some secrets to Styxx life. Not only can this be seen as the Acheron novel in Styxxs' viewpoint, but it is also the truth behind all of the lies Acheron was, the story of what really happened between these two brothers whom were doomed to a life of tragedy before they even took their first breath. Fans of the Dark Hunter series, me included, have probably always hated Styxx. Seeing him as the arrogant, selfish, s.o.b. Prince who cared for nothing or anyone other than himself. The good son that was doted on, loved and adored by all, who had to want for n, othing, the brother that was allowed to be a boy. We were all so dreadfully wrong. Styxx not only suffered as much as Acheron, but more-so, because the Destiny that he should had was stripped from him when Ash was placed inside of his womb. Leaving him with only half of his powers, the half that caused him pain with no way to alleviate it. And while Acheron's suffering ended after twenty one years, Styxx had to endure an additional eleven thousand years of misery. Readers will learn that not only did Styxx love his brother, he loved him so much, that even though he was suffering through his own Hel, he wanted nothing more than to free his brother of his, even at the cost of his own life. So much so that the only object in his possession that he ever held value to was a wooden horse; a horse that belonged to Acheron whom he promised he would hold on to and take care of, which he did for eleven thousand years. A new light is cast upon Ryssa as well; the supposedly loving sister whose journals told the original story of Acheron. The only person in the Aricles family to show Ash any type of love or compassion, or so it seemed. Had it not been for her, two brothers' who loved one another more than anything else until the day they were cruelly ripped apart, would have found there way back to each other if her fueling the hatred within Acheron. A hatred placed there by Ryssa, the sister he held dear, and Estes, the uncle who turned his childhood to something even worst than a living Hel. Bet'anya, the Egyptian Goddess of Wrath, Misery and the Hunt, was reborn after unleashing a fury so strong it made Apolymi look like a Saint when tricked into killing the only man she gave her heart to. But there's was a love so strong that her Warrior swore to her before battle, a battle to defend her honor, that should he parish, his soul would not rest until it found its way back to her. Though when they do find one another again, they may be forced to repeat their own history. Readers who needed one box of tissues when reading Acheron, prepare to need two while reading Styxx. Never has there been a character more noble, loving, selfless than he. Forced to endure unspeakable horrors at the hands of the very people who were supposed to love him in total silence. A silence he perfected so well that from the outside everyone thought him to be the privileged Prince that he should have been. Styxx is a must read if there ever was one. A story that will pull at the heart-strings of even the most cold-blooded of people. Even Savitar shed a tear when he learned the real truth of events. And it is by no means lacking in action.